Hisashi's sister-in-law. 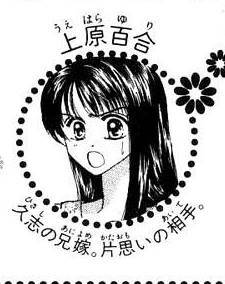 She's young and pretty, and apparently Hisashi's had a crush on her for six years before she went and married his older brother. It was because of this that Hisashi had run away from home in the first place. Yuri is nice and carefree, and becomes good friends with Nao. She turns into a "kissing monster" when she's drunk (she's 21). She is also a shopaholic.